DALLAS — Jewish colleagues remember Ebby Halliday Acers — one of the city’s most beloved business icons — as a comrade, role model, advocate, and true friend. On Sept. 8, Halliday Acers died in her sleep of natural causes — family and friends by her side. She was 104. The now-defunct Southwest region of the American Jewish Congress honored Halliday Acers in 2002 with their prestigious “Flame Of Honor” Award. This accolade is presented to community-committed people of exceptional moral courage who demonstrate an exceptional personal example. Gil Elan, president and CEO of the Southwest Jewish Congress, remembers the evening in which Halliday Acers received that award as entertaining and successful for everyone concerned. Even when Halliday Acers unexpectedly asked for an unscheduled 10 minutes onstage to pay tribute to her good friend Louise Gartner, the fun simply did not stop. “Ebby not only accepted her award with eloquent charm and humor, but she also entertained the audience with her ukulele,” Elan explained. Susan Myers, Southwest Jewish Congress administrative manager, said this performance was one of her fondest memories of Halliday Acers. “With the ukulele she brought along, she played a song that she’d written,” Myers said. Ebby Halliday Realtor Marilyn Pailet remembers that musical routine really well. Halliday Acers — who won numerous awards over the years — played the ukulele at a lot of similar ceremonies. The responsibility for that event transitioned to the Southwest Jewish Congress. Halliday Acers is still listed as an award winner on the SJC website. After the 2002 award ceremony was over, Halliday Acers continued to attend the event each year, always open to assisting others. From the very beginning, Halliday Acers was always known for giving 100 percent. Born Vera Lucille Koch, March 1911 in Leslie, Arkansas, Halliday Acers graduated from high school in Abilene, Kansas in 1929. She went on to land a $10-a-week job selling women’s hats at The Jones Store in Kansas City. Less than 365 days later, she was the top salesperson there. In 1938, Halliday Acers was asked to take over the millinery department at Dallas’ W.A. Green Store. It wasn’t long before she had her own Dallas boutique, Ebby’s Hats. Halliday Acers founded her own real estate company in 1945. Later, Halliday Acers amended her list of priorities — which mostly emphasized hard work — to include love. She met former FBI agent Maurice Halliday Acers, her future husband, at a speaking engagement Beaumont in 1958. She was 46. In a November 2010 interview in Mobility Magazine, Halliday Acers recounted how everything changed when she met and eventually married Maurice Halliday Acers, the love of her life. It would have been easy to perceive the business power couple as glamorous unless one truly understood how grounded they both were, friends emphasized. The two did not have children, but Halliday Acers always made a point of helping educate and support young people. Maurice Halliday Acers died in 1993. Halliday Acers went on to celebrate her 100th birthday in 2011. To many of her Jewish employees, she was the ideal, caring boss. Ebby Halliday Realtor Martha Morguloff, who teams with her daughter Danna Morguloff-Hayden on the job, said Halliday Acers was generous beyond belief to Jewish causes and community needs. She never refused when asked to donate. Halliday Acers continually supported the Jewish Federation of Greater Dallas, Akiba Academy and Southwest Jewish Congress, confirmed Steve Smith, public relations manager for Ebby Halliday Realtors. Halliday Acers’ long list of friends includes former President George W. Bush. He issued a statement last week expressing sadness at her passing. 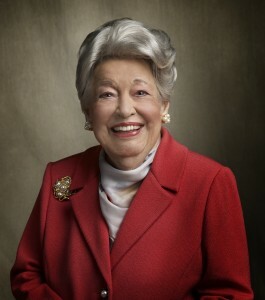 In a release, Mary Frances Burleson, president and CEO of The Ebby Halliday Companies, also lamented the loss of the Dallas icon. At a time when opportunities for women were limited, Halliday Acers was well-known for opening doors to careers for thousands of them. At least a few of those ladies were Jewish. Donsky said Halliday Acers always made a point of sending cards to her Jewish employees during the Jewish holidays — and she took this responsibility very seriously. “Whenever you wrote her back to thank her for a thank-you letter, she would send you another note saying ‘thank you for the thank-you letter about my thank-you letter.’ It would just keep going back and forth,” she said. As her “Flame Of Honor” Award performance indicated, Halliday Acers was well-known for her cute songs and ukulele playing, Donsky said. Even at her packed, Sept. 17 memorial service at Park Cities Baptist Church, a video was played showing Halliday Acers strumming the uke and singing. The audience got an example of Halliday Acers’ determination to be thankful to the fullest extent. At the end of that video, a note was displayed on the screen in Halliday Acers’ writing.